It is the sad duty of the EHF to report the death of the long-standing manager of Spanish team, Abanca Ademar Leon, José Ludena, at the age of 53. The Leon team was told of his death on a stopover at Amsterdam airport on the way to their VELUX EHF Champions League match in Norway against Elverum Handball. 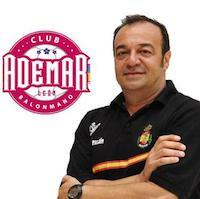 José Ludena had been manager of Abanca Ademar Leon for many years, he was highly admired within the Spanish club, having never left the club from his home city, even in the most difficult of times. Ludena was also a well-known figure within European club and international handball through his work for Leon and also the Royal Spanish Handball Federation and the Spanish national teams. The staff and officials of the EHF would like to pass their sincere condolences to José Ludena's family and friends at this very difficult time. His funeral will be held on Monday, 4 December 2017. Leon also played tribute to him and his life's work for the club on their website. A moment of silence will be held to honour José Ludena's memory ahead of the game between Elverum Handball and Abanca Ademar Leon (on Sunday, 3 December at 17:00hrs.